You are currently browsing the category archive for the ‘quilt show’ category. New Clambake kits are ready to go. The last Clambake was a big success and you have shown me that you’re not intimidated by curves. That they’re actually pretty simple! Aren’t these little bunnies the cutest?! 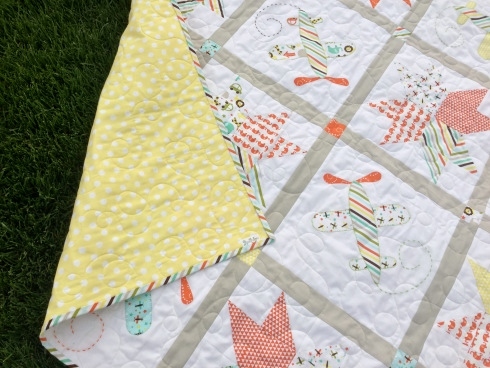 It’s the perfect quilt to get your spring mood going. Paige did some fabulous quilting for me. Swirls in the borders and a sweet pop up flower in each clamshell. If you remember from the last Clambake post, all of the clamshells are easily attached to the top border, glue basted on and top stitched with your machine. No pinning. No hand sewing! 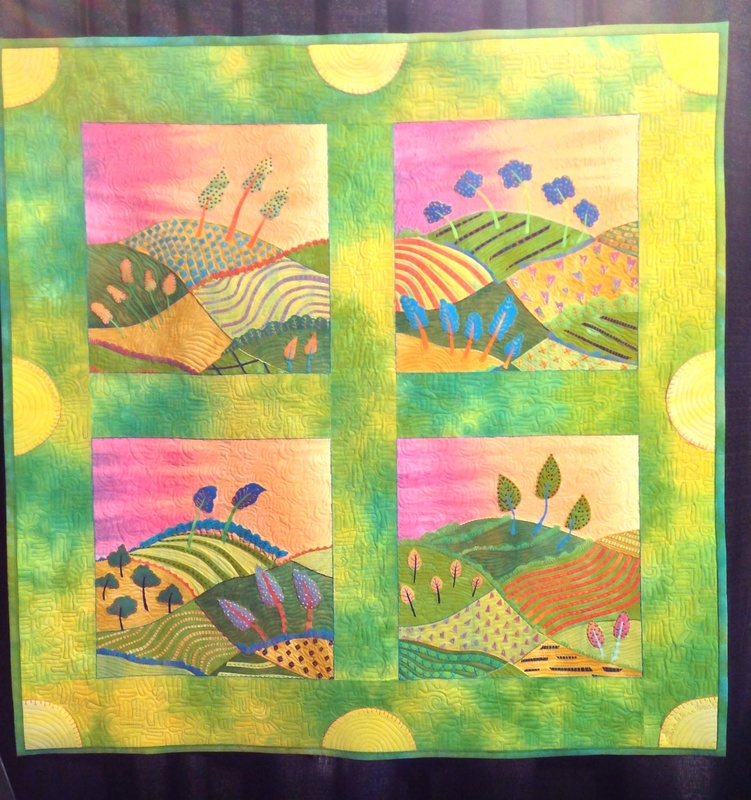 Each fabric from the line is used in the quilt. The border is a teal pressed flower. The binding is a navy dragonfly. 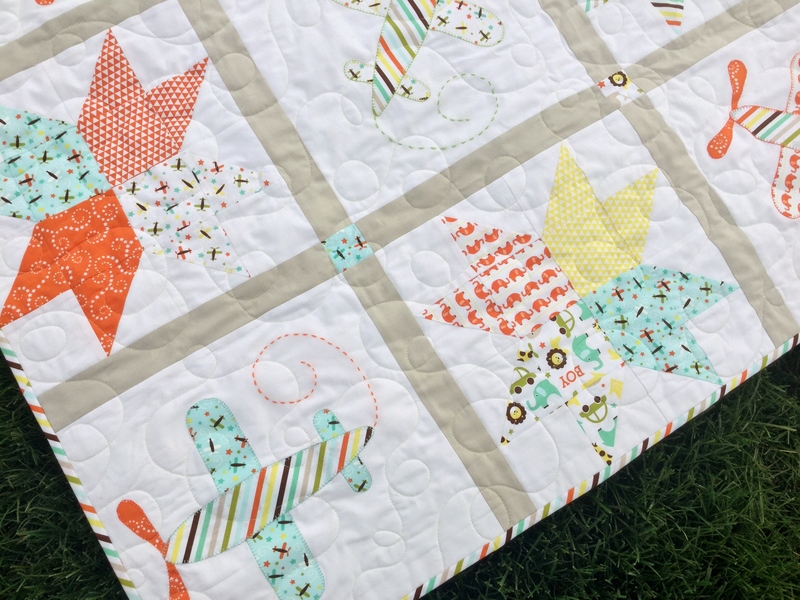 Clambake measures 55″ x 62″ and is a perfect lap quilt. Kit includes all the fabrics for the quilt top, binding and the pattern. 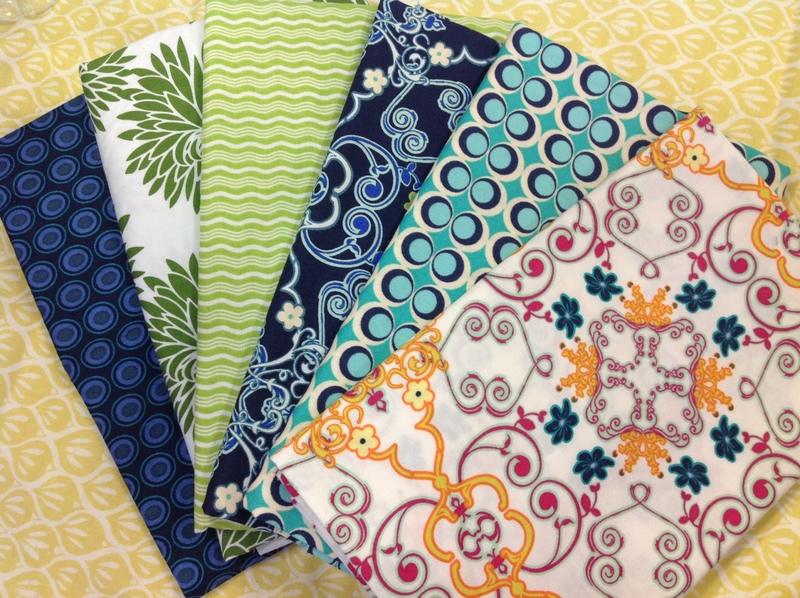 As always, I try to share useful info to ensure a successful sewing and quilting experience, so helpful tips and tricks are posted on this blog post HERE. 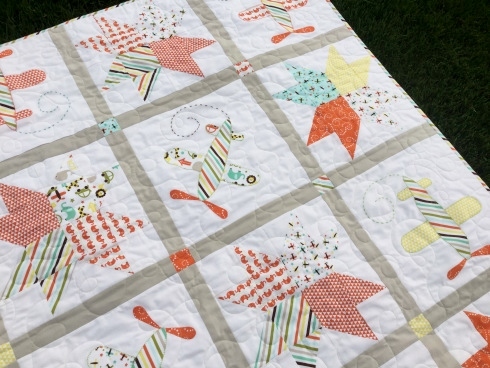 Clambake KITS, PATTERN, and APPLIQUÉ KIT can be found now in the SewModDesigns Etsy shop. And you can also find all of these plus the Curiousities line at our upcoming show in Napierville for the Riverwalk Quilters Guild. We hope to see you there. It’s going to be a great show! 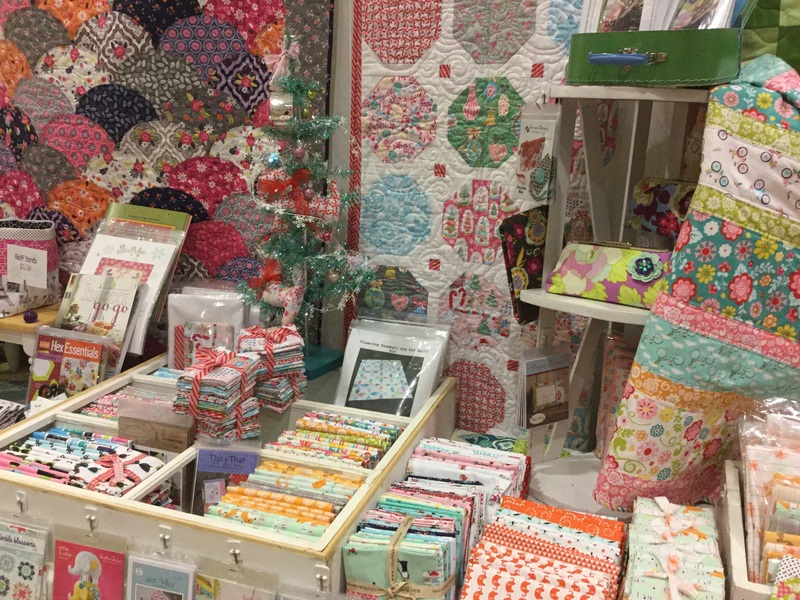 We hope to see you this weekend for our first quilt show of 2016! New fabrics, kits and patterns will be available. If you happen to see something you’re interested in on the blog or in the shop and would like me to bring it or put a hold on it for you, I’m always happy to do that. Just convo me and I’ll put your name on it. Stop by the booth and say Hi! 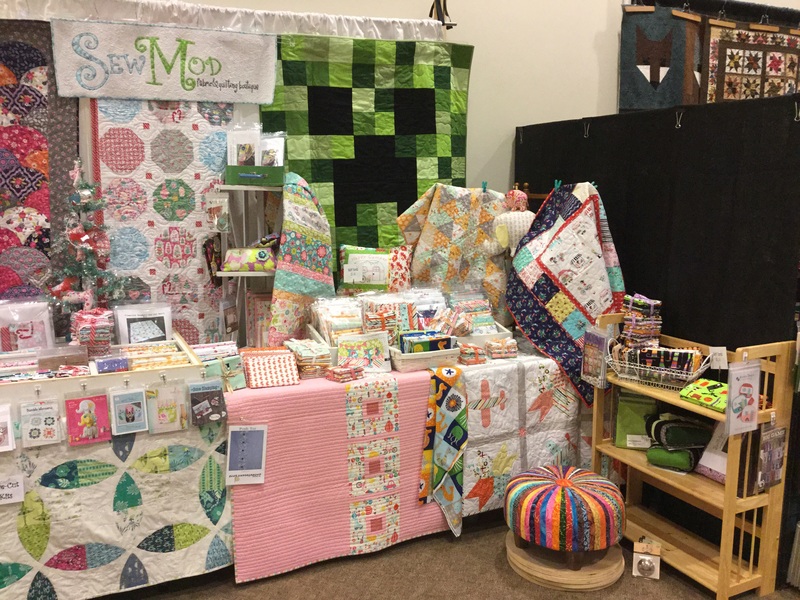 I want to thank the Country Quilters of McHenry quilt guild and all of our customers who stopped by last weekend to see us! We had a very successful show and we couldn’t have done it without you. This coming weekend we will be in Minooka IL. please stop by if you’re in the area. We’d love to see you too! Here’s a few pics from last weekend if you couldn’t make it out. 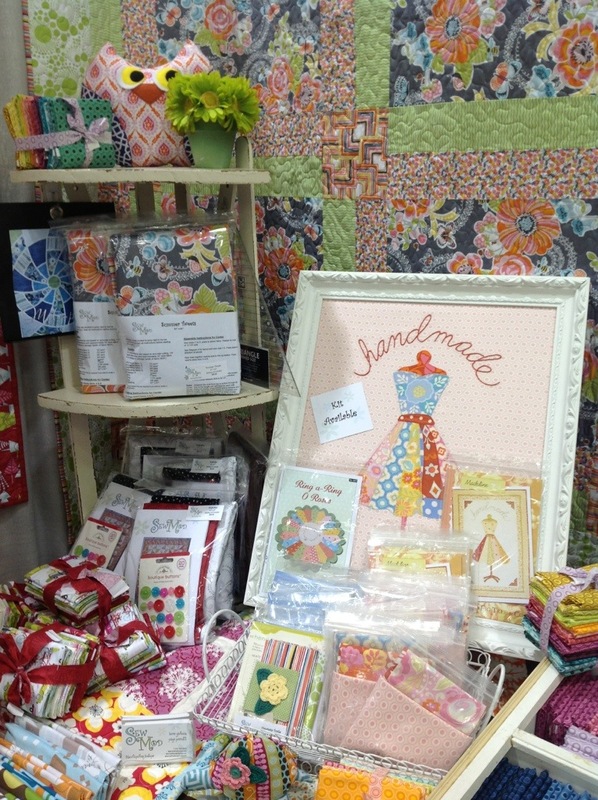 Our biggest sellers last weekend was just about anything that my mom made as a shop sample! 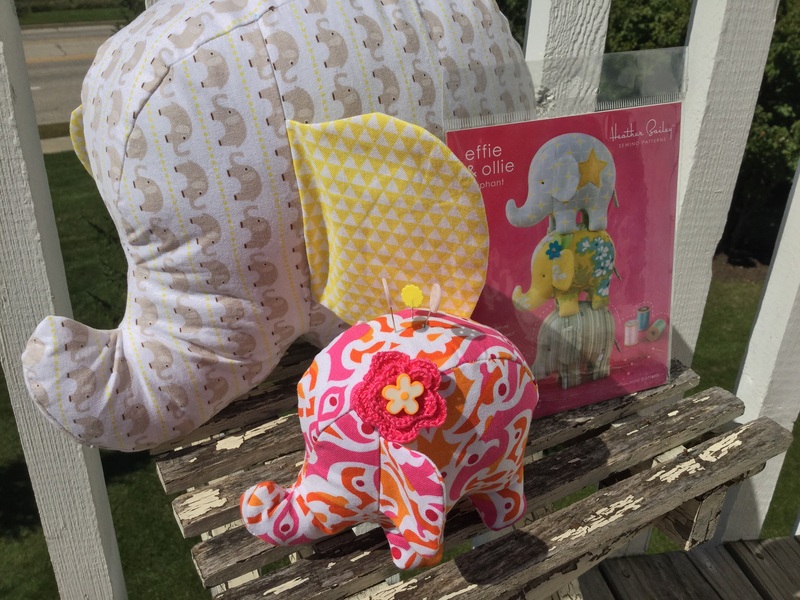 Effie The Elephant was a big hit. A cute little pincushion pattern by Heather Bailey. The pattern comes with the template for the small one but we thought it would be fun to enlarge it 175% and make a big softie for baby too! 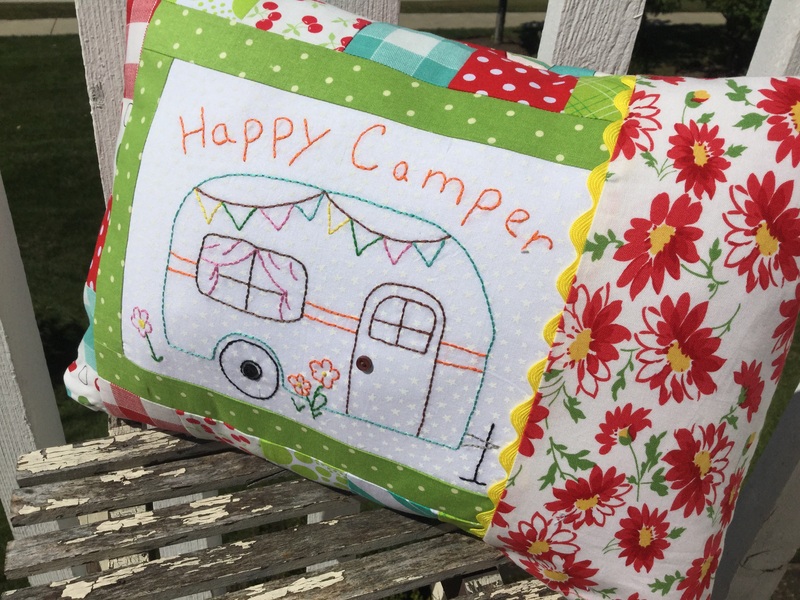 Happy Camper embroidered pillow from This & That. Of course her hand crocheted flowers. These make great embellishments for just about anything. 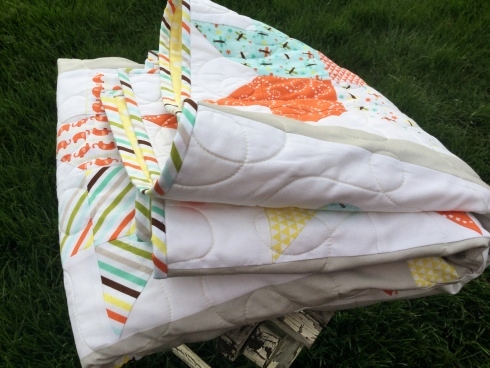 And the Good Natured Equilateral Baby Quilt kit. We sold out of all of these except the kits. There’s a few of those still in stock (here) and I’ve reorded all the patterns. I’m hoping to get those in by Friday’s show. 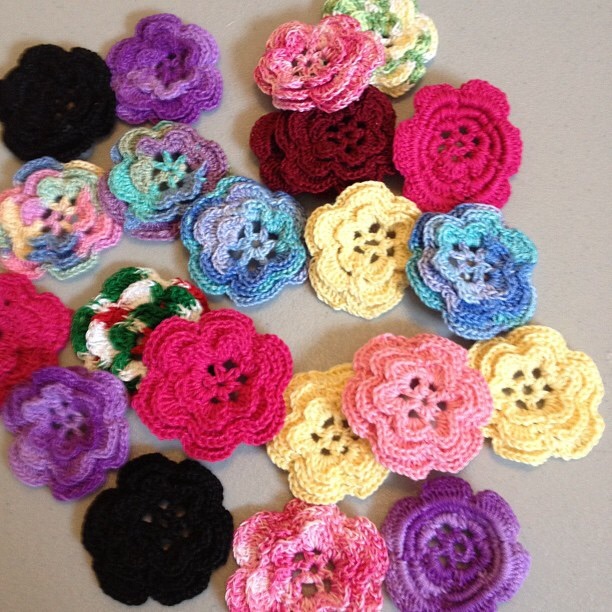 I did ‘reorder’ the crochet flowers but you just can’t rush handmade! 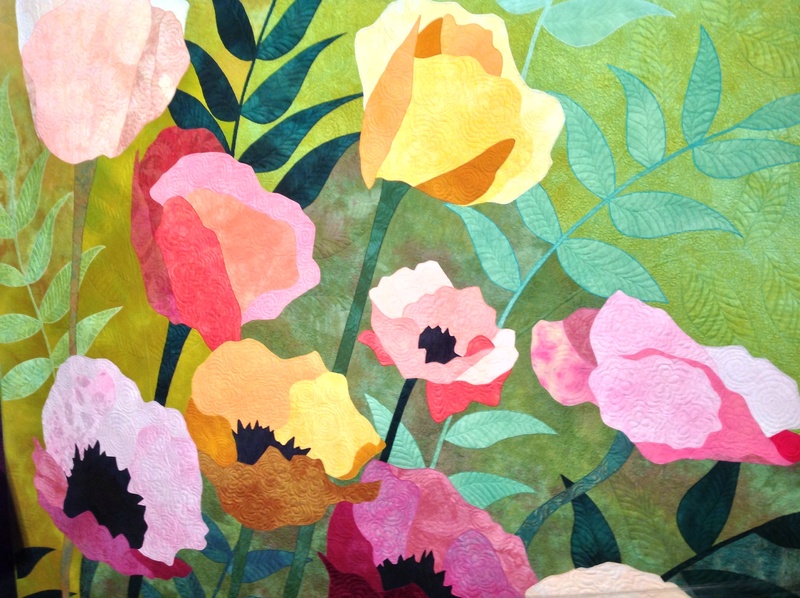 Join us for our first Fall quilt show this weekend in Crystal Lake. We love to meet our customers! Having an online shop has some really serious benefits (like sewing in your pajamas)but one of the drawbacks is not being able to meet and spend time with our customers, which is one of the reasons I love to do shows. So head over if you have time this weekend and say Hi! 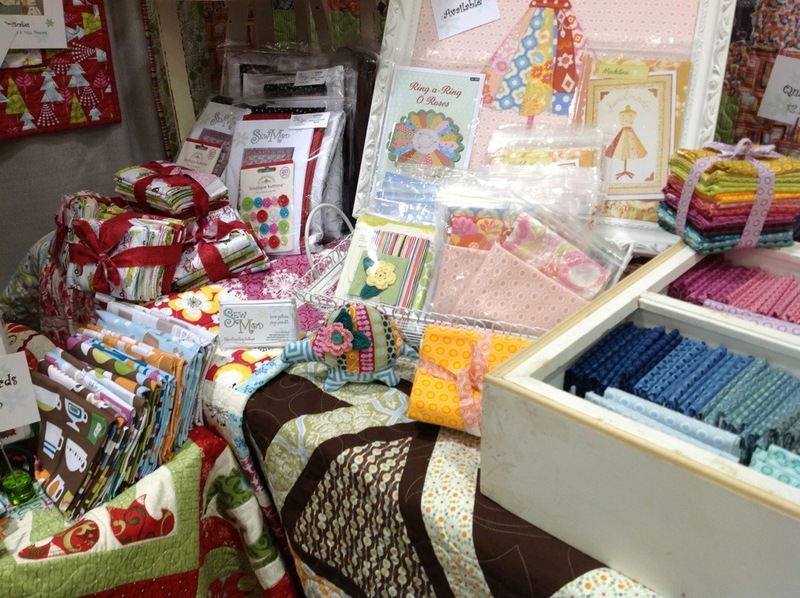 For other local show dates, click on the header “Visit SewMod” at the top of the blog. I had made so many HST’s that they were running outta my ears. I kinda got carried away and seeing how fabric is not something to be wasted these days, I was determined to use them. 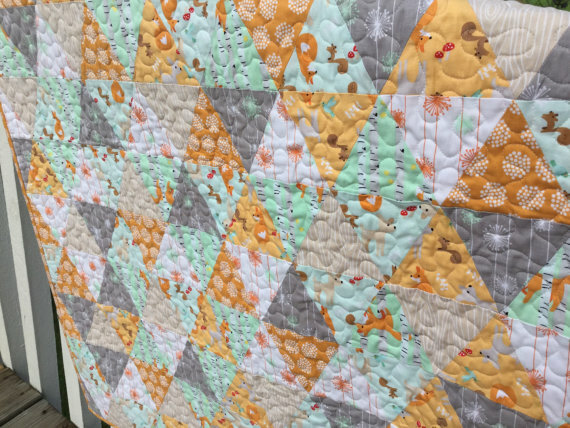 At first this quilt was just going to be a simple star to star block. No bells and no whistles. But how much fun would that be? I love appliqué. I love embroidery. 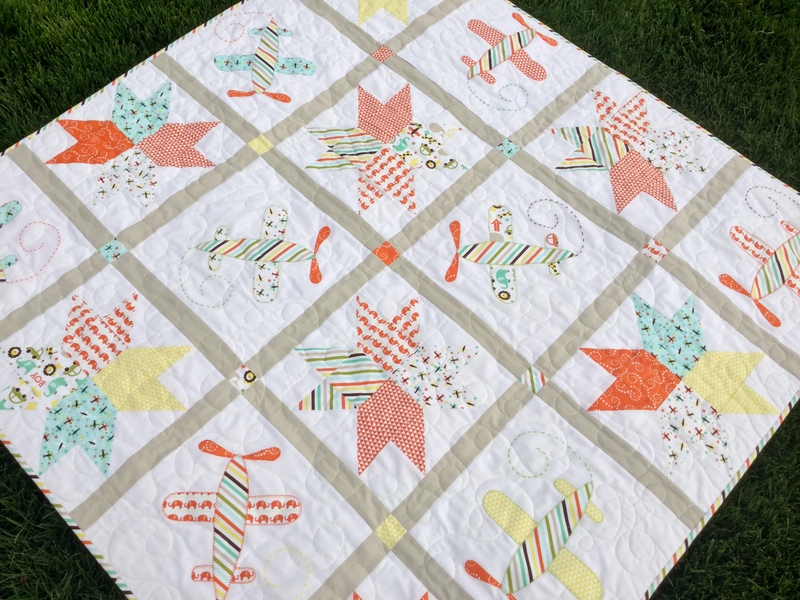 I replicated the plane from the Oh Boy main fabric, positioned the planes horizontally and diagonally to give it the soaring effect through the quilt. 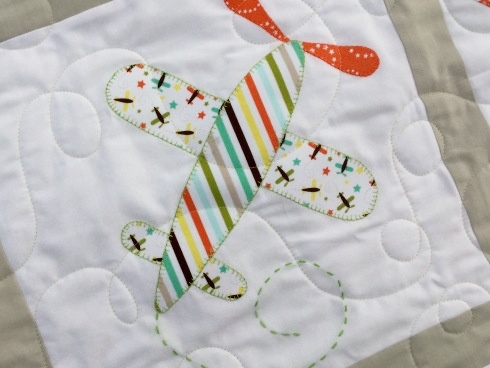 Appliquéing the planes with different colors of thread and hand embroidering the smoke trails gave it the extra whimsy touch. I used a Kona Ash to frame everything and before you knew it, I had a finished quilt. Paige quilted it for me in a loopy soar and I finished it off with the stripe binding and a polka dot backing…so sweet! The quilt is always the fast part of the process. It’s been finished for about 3 weeks now. It’s the pattern writing that tends to send the creative process to a slow. turtle. crawl. It needs to be written, tested, and left for a bit do do it all over again…not something to be rushed. And it always helps to have a pattern tester. So now that I’ve completed the pattern step, I get to blog about it and cut the kits! I love cutting the kits. Kit includes the free pattern, enough fabric for the front & binding…and enough HST paper to make your own perfect stars! The great thing about this baby kit is that there’s hardly any waste. I love that too. If you’d like to purchase a Seeing Stars Kit, you can visit the SewModDesigns Etsy shop. Kit is $45.00 plus $5.75 shipping for US customers. International shipping rates vary. They could be landing in your sewing room shortly! Wendy and I had a fun Friday. 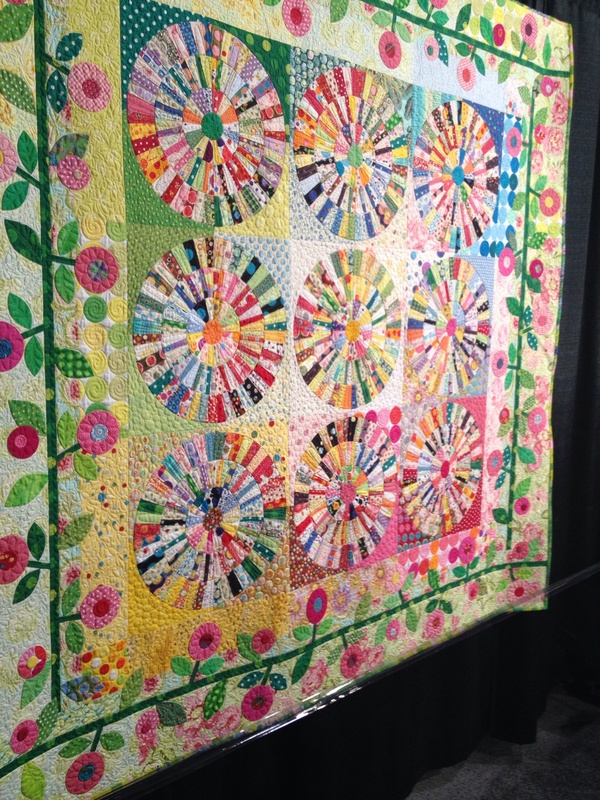 We visited the International Quilt Festival here in Chicago then had some Cheesecake Factory…sans the cheesecake since I’m dieting…more on that subject later.. I had a lot more pics I wanted to show but my iPad seemed to have a ghostly visitor that day. Perhaps from quilters past? 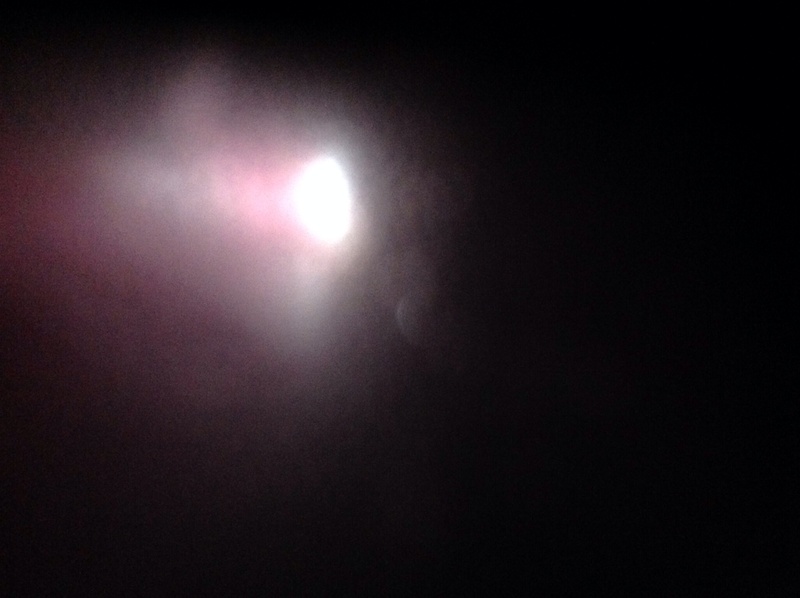 I had about 96 photos where this ‘light’ got progressively smaller till it was pitch black. Spooky. I promptly deleted my ghost and here’s what’s left y’all. Enjoy. Sorry I don’t have more for you. 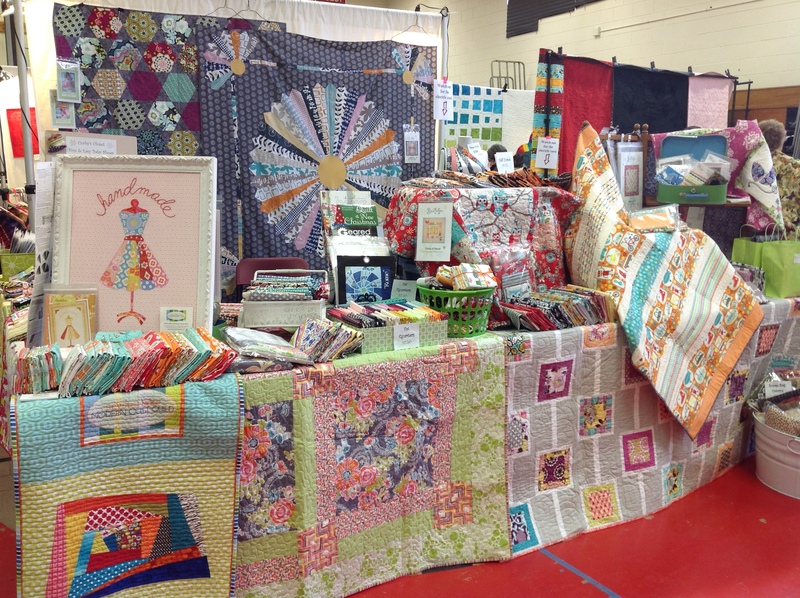 A big thanks to everyone who came to see us at the Pride Of The Prairie quilt show last weekend. It was a huge success and we really love vending there. We were so busy I didn’t even get a chance to see the quilts but I heard they were beautiful…bummer. I worked my mad skills on the booth. I seem to enjoy that process a lot. I love seeing the transformation from a backdrop and a table to something that draws people over..smiling and shopping of course. I wish I had taken a before pic. 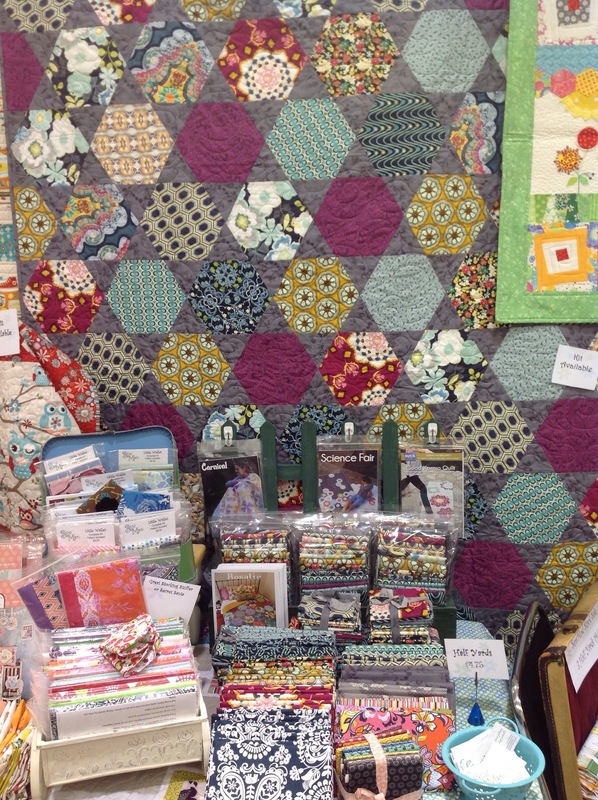 Did a little promoting of the Crystal lake Modern Quilt Guild, which by the way is growing tremendously. We now have 61 members and its only our 1st year! I’d say that is amazing, right! 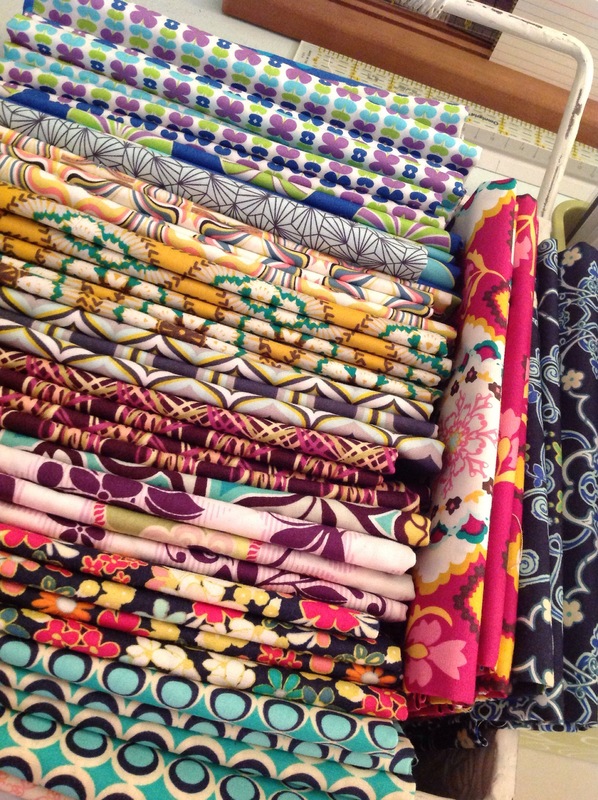 And Paige managed to work her mad skills creating some more SewMod Stacks while we were there. You can find these and many more in the Etsy shop. I added about 12 new sets the other day. 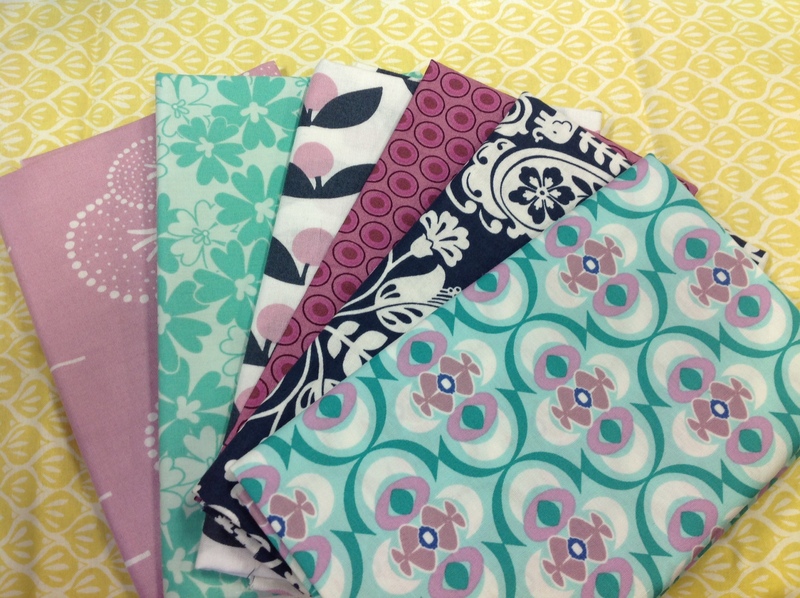 The SewMod Stacks pull from different fabric companies & different lines to mix & match. 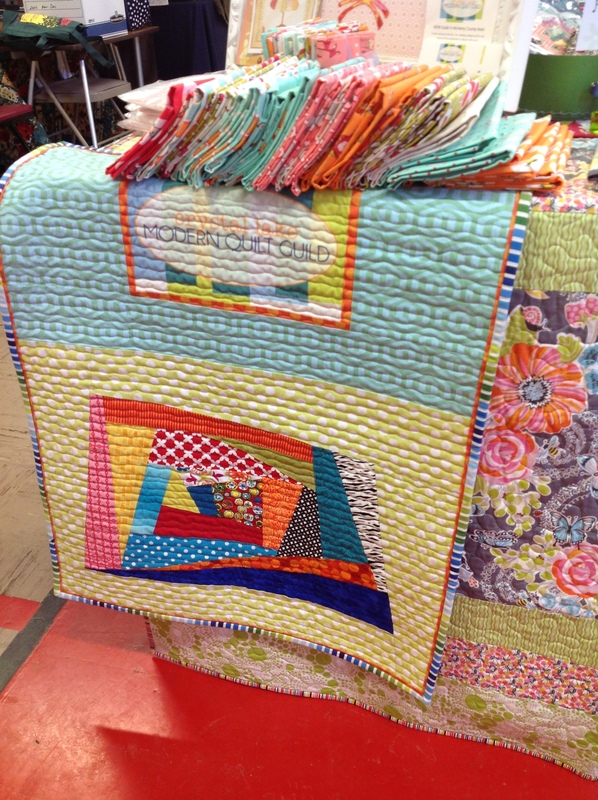 We like to show quilters that you can jump out of that pre-made bundle and mix it up. It’s ok to do your own thing! The SewMod Stacks tend to sell pretty fast. We offer them at a 15% discount. It was really hard trying to keep Paige away from sneaking off with them for herself! Next week were releasing a new SewMod pattern so stay tuned ya’ll. Until then have a great weekend! Come visit us the weekend of March 8th & 9th, 2014 in Crest Hill, IL. 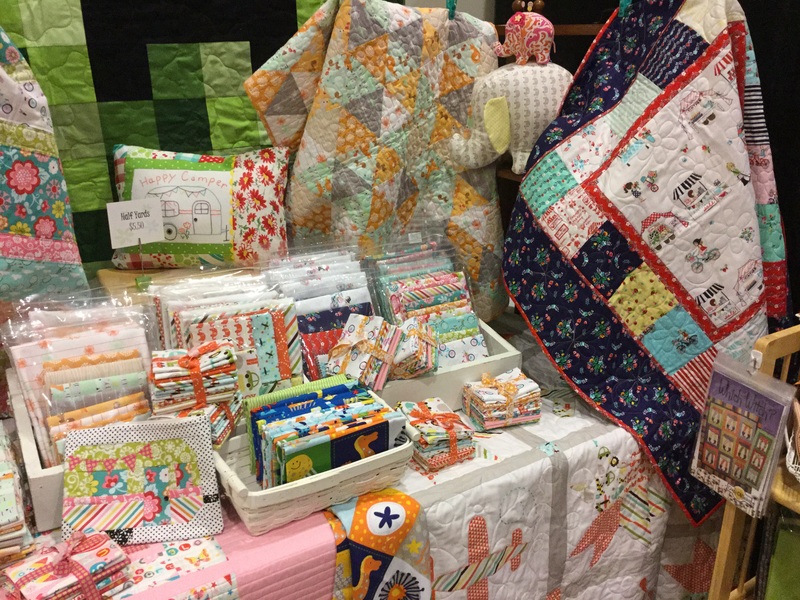 We will be vending with the Pride Of The Prairie Quilt Guild. We’ve begun cutting and preparing kits. And we have some new and exciting things to share! 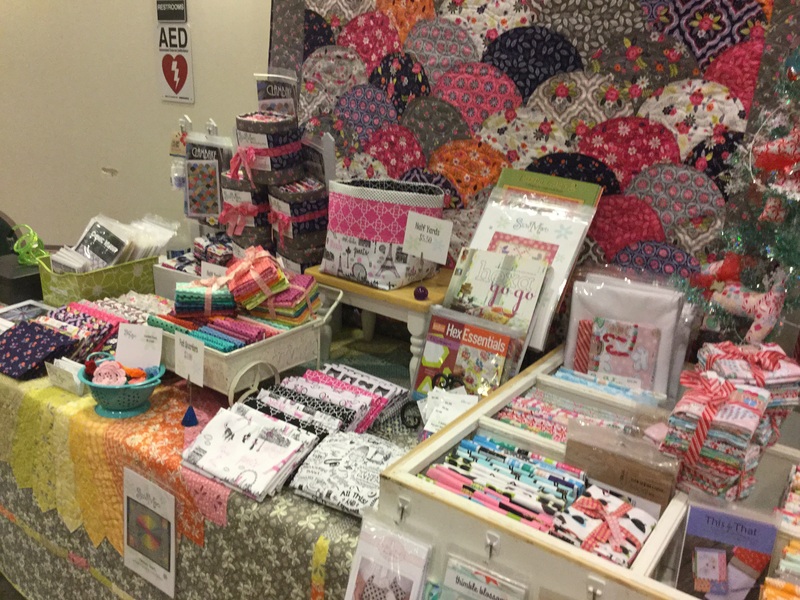 This is a small but wonderful quilt show that we really enjoyed vending at last time. Friendly people and beautiful quilts! We’d love to see you there! Time’s Flying By…It’s Fall Ya’ll! There’s a new chill in the air and as I was walking daisy this morning, I realized how much I love fall in Chicago. The leaves change beautiful colors, the air is crisp, its apple pickin’ time and lets not forget my favorite drink at Starbucks is out..Pumpkin Spice Lattes! And you know another great thing about fall? It’s time to start decorating for the holidays! We had two big hits in Madison this year that will surely inspire you & light a fire under your britches to start working on those holiday projects. 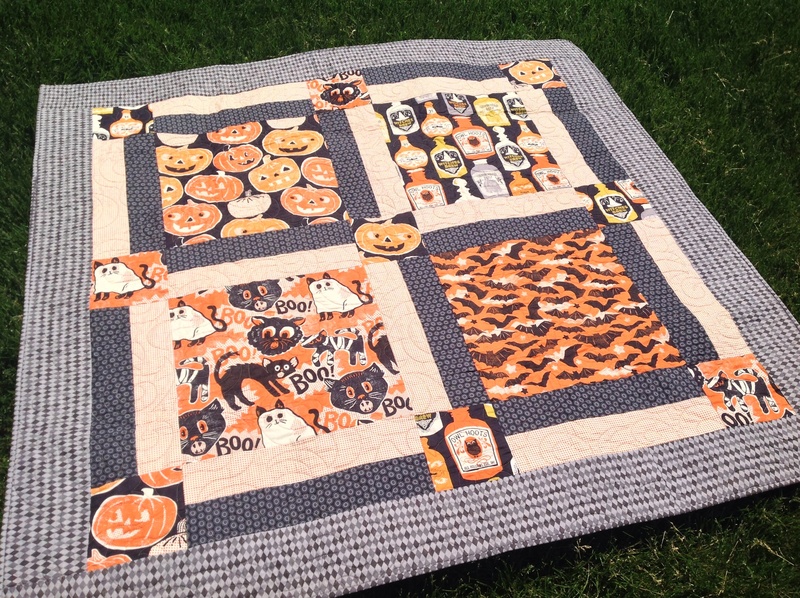 Blend fabrics has a new line out called Spooktacular. It was so popular that we’ve ordered a second round of bolts. 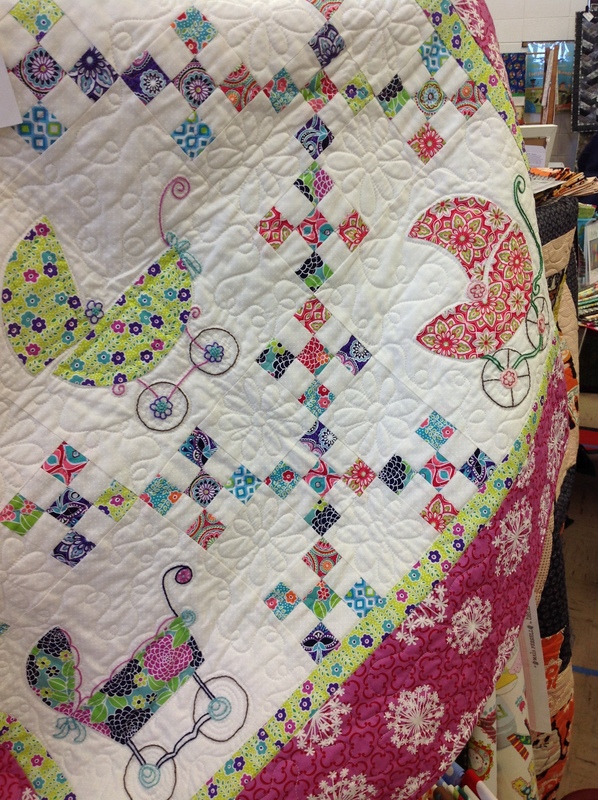 We made this quilt with our Summer Tweets pattern. So simple that the top can be assembled from start to finish in a day! Summer Tweets was perfect for showing off the large scale prints. I just love that apothecary jar fabric. We can’t forget Christmas! 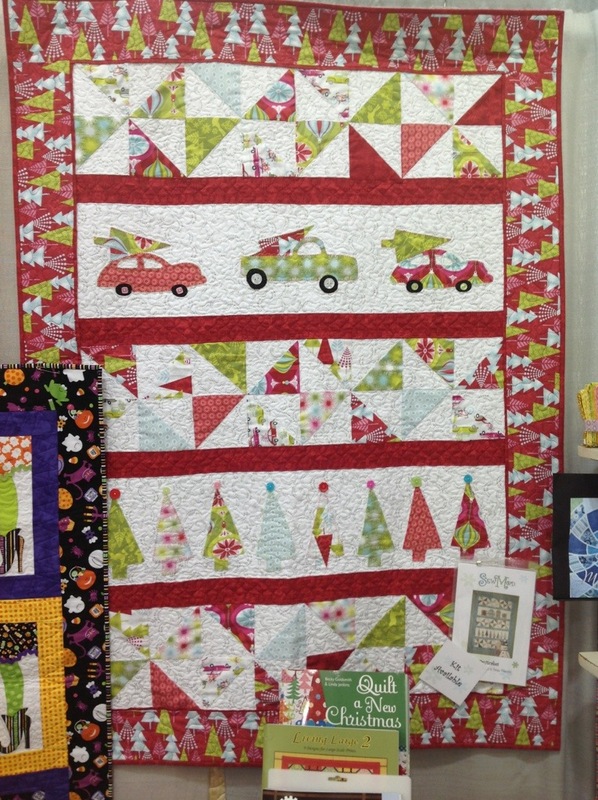 We have another fun line from Blend fabrics called Hip Holiday. It reminds me of Christmas Vacation when Clark puts that big tree on top of car! I couldn’t resist making this from our pattern called Fruitcakes. I spiced it up a bit though by adding a car & tree appliqué template. Stop by the shop or give me a shout out for more info. 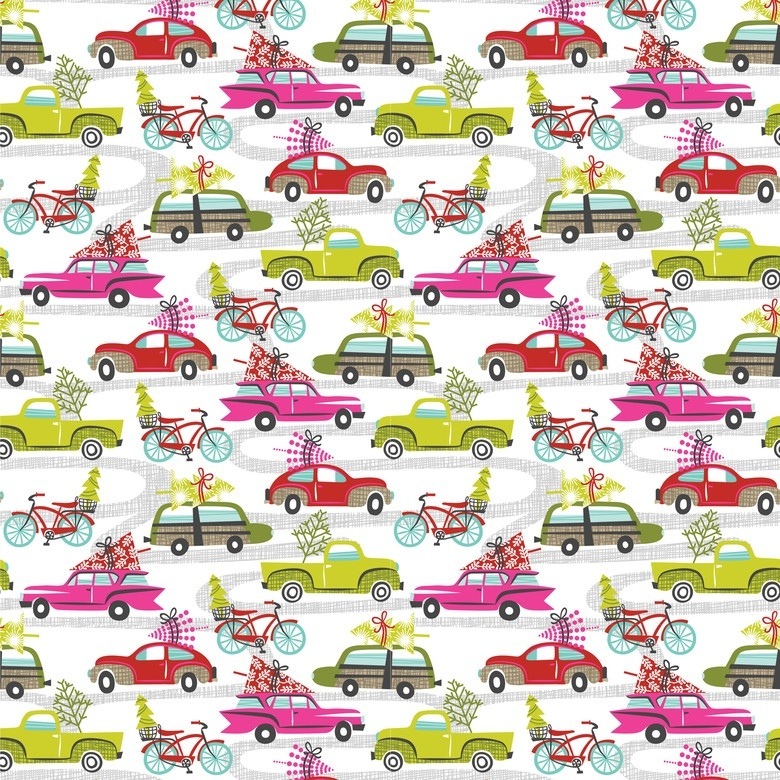 We have some kits left and a few more half yards and yardages. 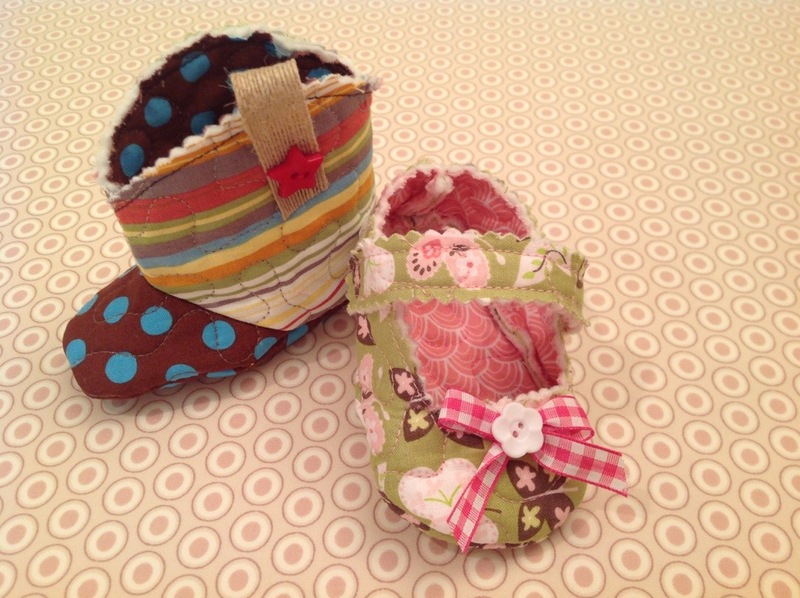 We always have the Curby Shoe patterns in stock in the shop but I’ve never made them. 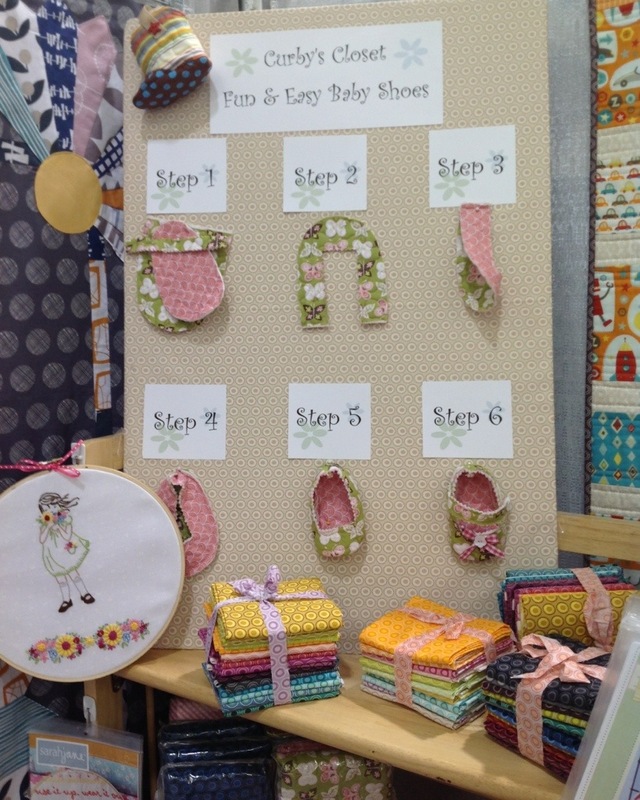 The thought of quilting my own fabric for this project made me whine…a lot, but this summer I visited my favorite quilt store in OKC, Oklahoma QuiltWorks, and they had this cute board display made up on how easy it was to make Curby Baby Shoes. I got Paige to do my quilted fabric and Wendy and I decided to give it a go. Besides, it would make a cute display for Madison. And guess what OKC was right. So cute and so easy! So I made our own little display board and a couple of sets of shoes as samples. The cowboy boot turned out super cute. 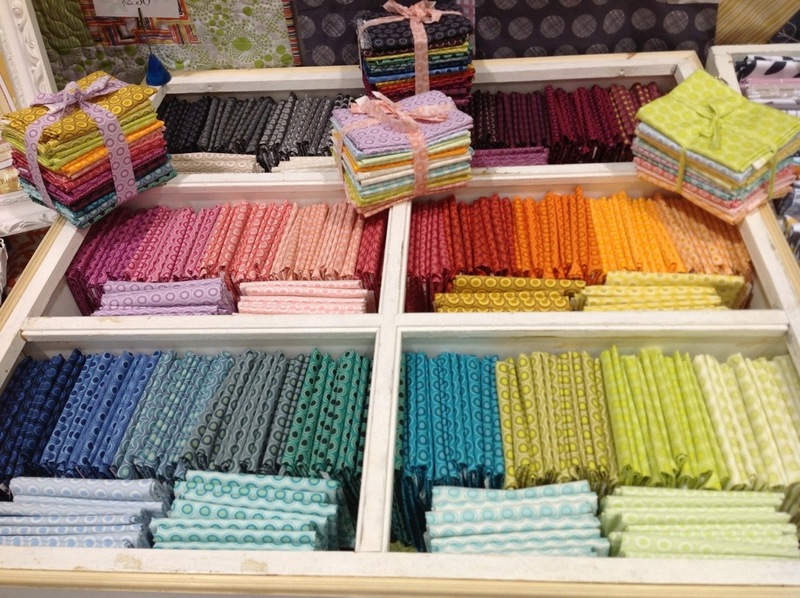 We cut tons of eye candy..aka Oval Elements from Art Gallery Fabrics. Everybody’s favorite. Who doesn’t want a rainbow of dots? 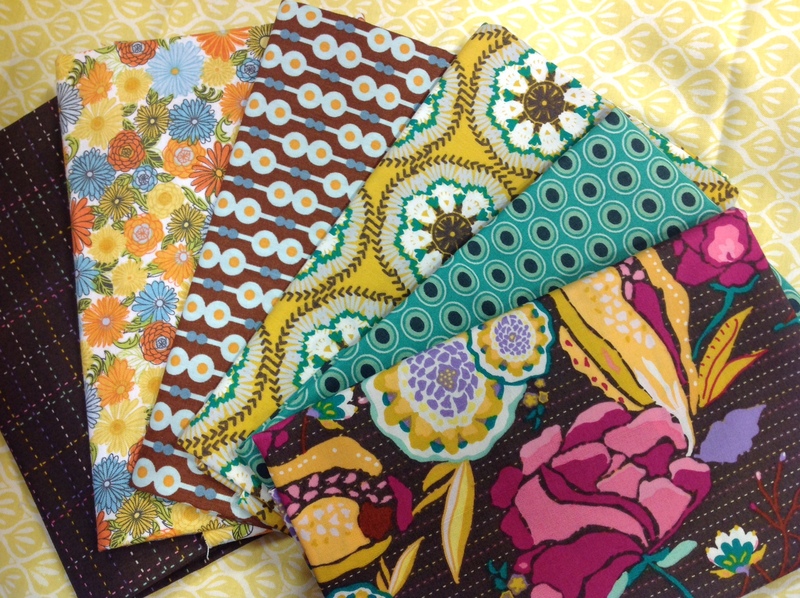 We ran a special of Create Any Bundle Of 11 or more and the fat quarters are as low as $2.19 a piece. Can’t beat that! And check out our show pet, Henrietta Turtle. 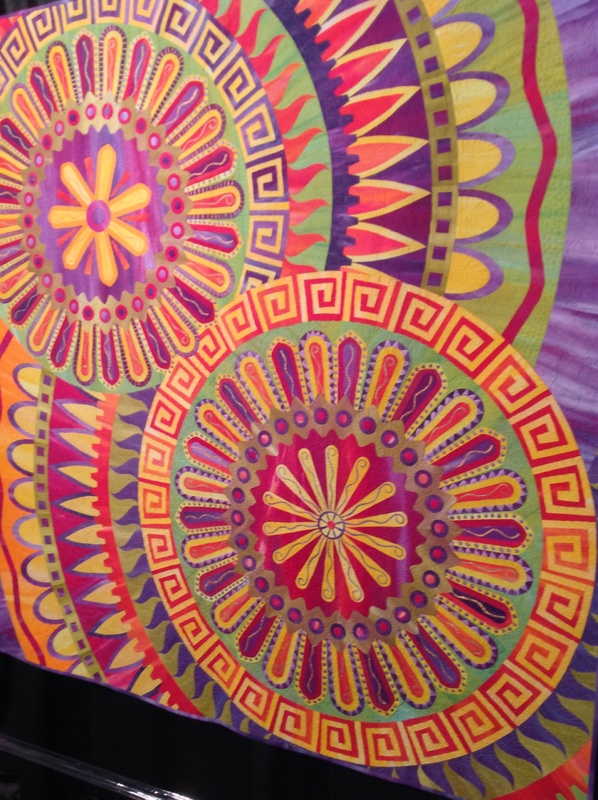 A pattern from Heather Bailey. My mom made this little sweetheart sample and she’s even got a unique SewMod twist..a hand crocheted flower! We kitted her up for only $13.50. Madeline is always a hit. So she joined us again this year. Perfect for your sewing room or in my case…something pretty to look at while I get ready in the morning. She adorns my bathroom wall. $16.00 for the scrappy kit and pattern. Several of our customers today commented on how reasonable our kits and overall pricing was. It’s nice to be able to provide that and pass some savings on to them. I even stood outside yesterday and passed out our extra vendor passes to four lucky ladies. Good deeds to start your day off right. It felt good! We’re looking forward to another great day today. We hope you’ll join us. If not, check back for more pics!